Parasyte was originally a manga that ran from 1988-1995, that was later turned into an anime that ran from October 9, 2014 – March 26, 2015. 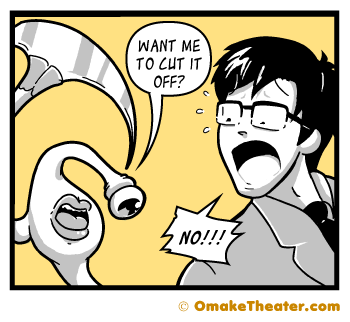 Four months after the anime finished running, I made my own Parasyte related Friday 4Koma. Now, most of Omake Theater‘s audience are English-speaking westerners who would not experience Parasyte until October of 2015 when it first started running on Adult Swim. Needless to say, with no reference to the series that comic wasn’t as widely understood as it could have been if it had been released today.